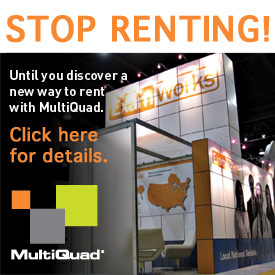 Add up to six 19" monitors to your MultiQuad with only one monitor mount! 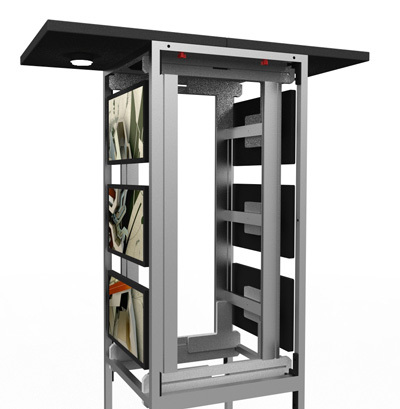 The Standard Ladder Mount for your MultiQuad allows you to expand your visibility with more monitors. The Ladder Mount allows you to hold up to three horizontally positioned 19" monitors per 1x4 MAX frame or two 22" vertically positioned ones. If you upgrade to the Premium Ladder Mount you can add an equal amount of monitors on the back side for a double sided display. You decide how to use the Ladder Mount. Add two on one side and one on the other, or use just one side at a time. 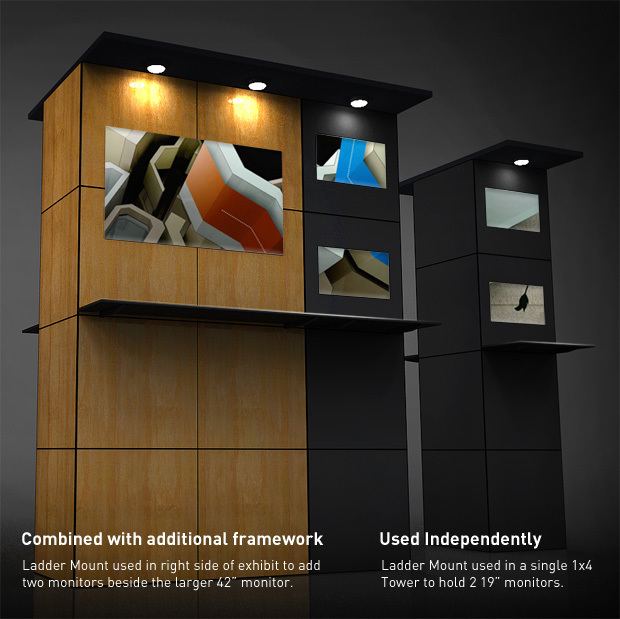 The flexibility of the Ladder Mount gives you various options for expanding the use of your MultiQuad exhibit. Ladder Mount easily attaches to the inside of your MultiQuad frame and securely holds 19" monitors on each side (premium model only). The example shown to the left shows the Ladder Mount in place on an exposed (no Quads) 1x4 MAX frame. The Ladder Mount is available for the 1x4 or 2x4 MAX frames (23" deep). 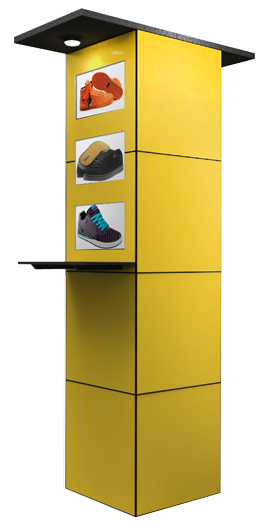 Use a single 1x4 MAX frame as an independent station or combine with other framework to build a larger exhibit. 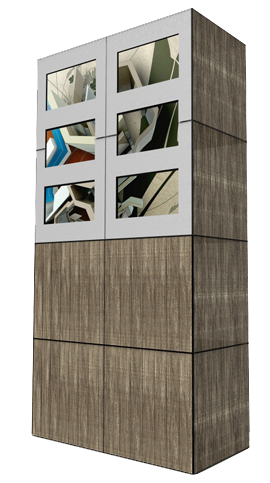 With Ladder Mount you can quickly and easily turn a 1x4 or 2x4 MAX MultiQuad frame into a dynamic media tower perfect for trade shows, lobbies, events and more. 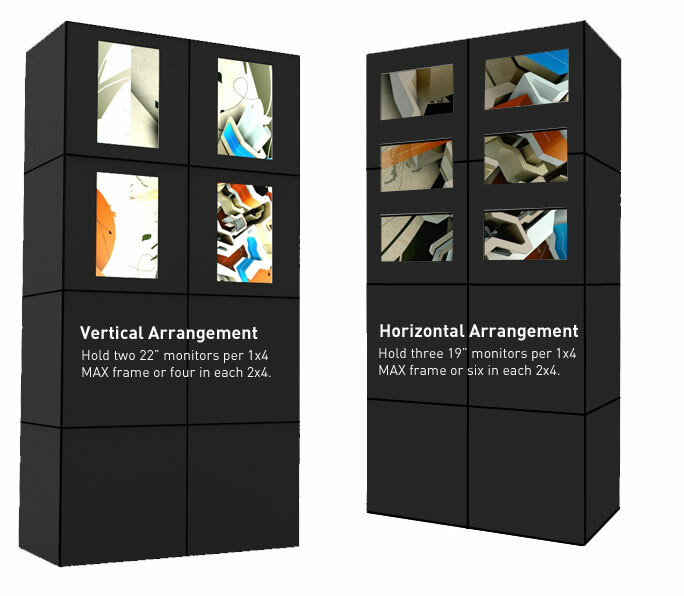 Using one 2x4 MAX frame, you can add up to 12 monitors (front and back each with six), creating a robust visual exhibit.